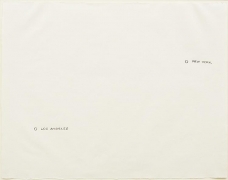 Arakawa, Jed Bark, Mel Bochner, Juan Downey, Alex Hay, Jasper Johns, Joseph Kosuth, Jeffrey Lew, Jane Logemann, Brice Marden, Gordon Matta-Clark, Richard Nonas, Robert Petersen, Robert Rauschenberg, Dorothea Rockburne, James Rosenquist, Keith Sonnier, Hisachika Takahashi, Cy Twombly, Susan Weil, Lawrence Weiner, Robert Whitman and Don Wyman. 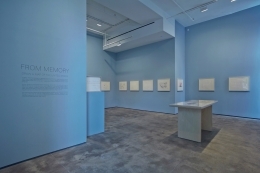 August 30, 2013 – Sean Kelly announces From Memory: Draw a Map of the United States, a project conceived and produced by Hisachika Takahashi. 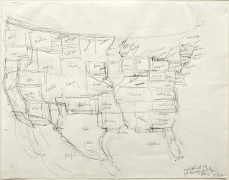 From 1971 through 1972, Takahashi, a Japanese artist living in New York, asked twenty-two fellow artists to each draw or paint a map of the United States entirely from memory on the handmade Japanese paper he provided. 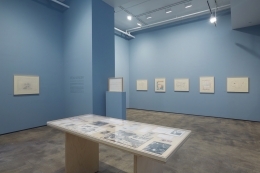 This exhibition presents, for the first time in New York, those twenty-two works and Takahashi’s own drawing, in addition to material from Takahashi’s archives, providing a unique glimpse into the New York art world during this period. 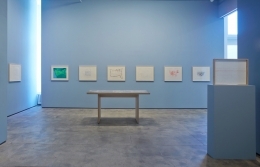 In addition to being a studio assistant to both Robert Rauschenberg and Lucio Fontana, Takahashi was also a chef at Gordon Matta-Clark's restaurant Food; he was an accomplished artist in his own right and a friend to many of the most well-known artists on the New York scene in the 60s and 70s. 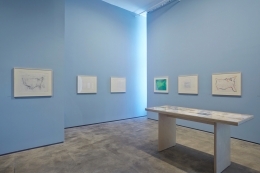 As an immigrant with limited English skills at the time, Takahashi was interested in these artists' conceptual ideas of their own country, as manifested in a visual form of universal expression that transcended language. 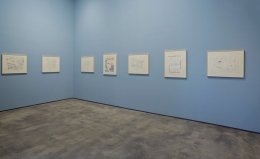 During this period, the visual and conceptual were becoming increasingly intertwined in the plastic arts, with maps serving as a known point of departure. 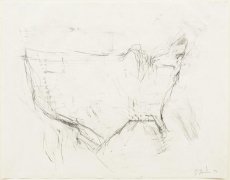 The exercise of drawing something as iconic as the shape of the United States from memory provided an opportunity for Takahashi to further investigate the perceived identity of his new home country. 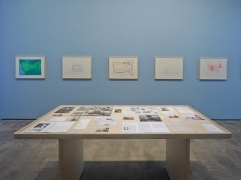 The various contributions are as diverse as the artists themselves: Mel Bochner’s map is a carefully rendered and accurate representation of the U.S., meticulously labeling all of the states; Dorothea Rockburne conceived the U.S. as a gridded three-dimensional cube, listing seemingly random locales such as Chambers St., Rio, Germany and Black Mountain, North Carolina along its horizontal axes; James Rosenquist’s United States is a check drawn on the “Fantastic National Bank of America”, made out to Takahashi, in the sum of the number one followed by so many zeros that it had to be continued on the verso of the drawing; Jasper Johns’s U.S. is composed of a series of deli- cate lines suggesting the footprint of the map with the placement of the larger states and the Great Lakes; Cy Twombly’s single, continuous line forms a pared-down silhouette of the country, with only one period at the end of the hand-written letters “USA”; and Joseph Kosuth’s version of the states is composed solely of two points – indicating the locations of New York and Los Angeles. 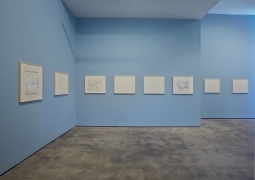 These drawings reveal a certain sense of shared nascent conceptual consciousness, without formal limitation, in their widely varied responses to Takahashi’s request. 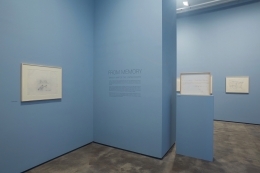 The works that comprise From Memory exemplify the undercurrent of artistic thought in this period by virtue of the idea of a single iconic structure – the map – recalled only from memory and subsequently represented as a direct translation of an idea that surpassed linguistic dependence. 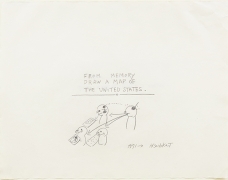 "An Exhibition of Artists Drawing Maps of the United States Opens at Sean Kelly Gallery"
"The Ridiculous Mistakes Artists Make When They Try to Draw the U.S. From Memory"
The Atlantic Cities, September 16, 2013. The Huffington Post," September 12, 2013.